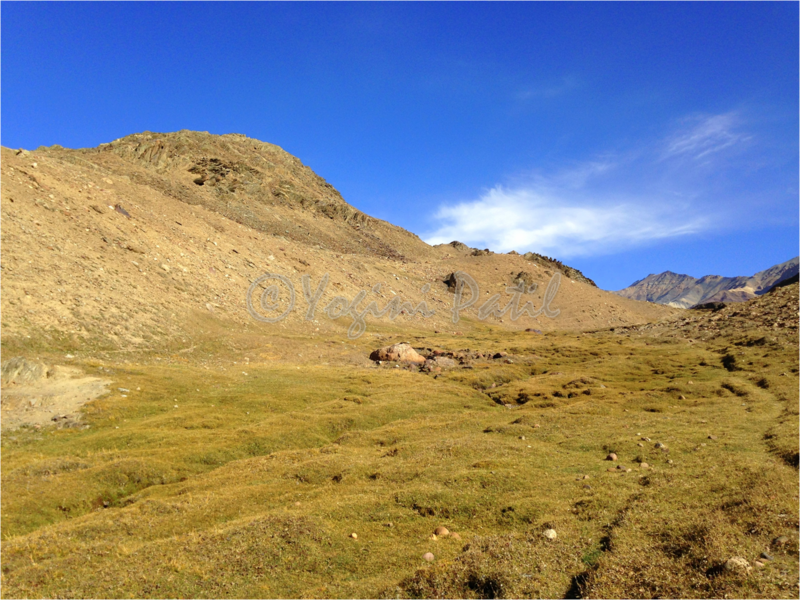 The cold mountain winds were blowing and making it difficult for me to walk anymore on the rough trek path towards the lake of moon – Chandratal, situated at an altitude of 14100 ft (4300 meters, approx.). 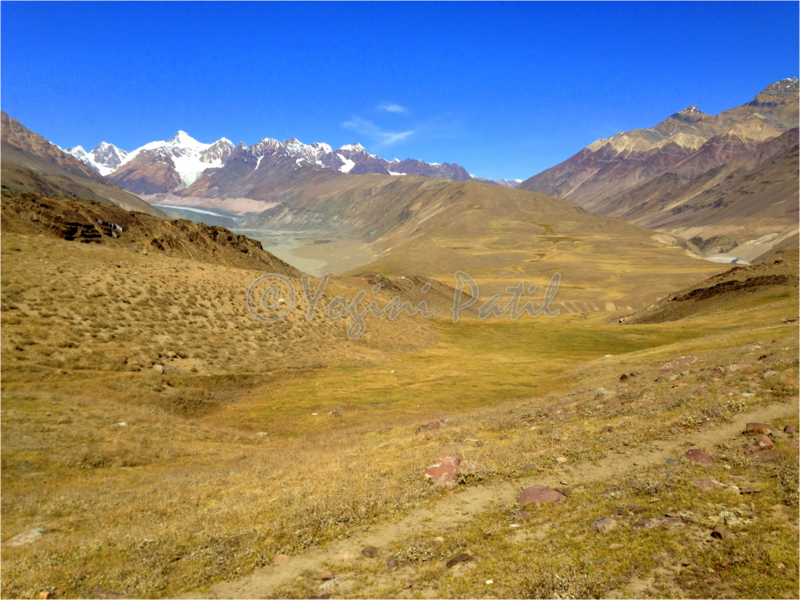 Halfway through, Tenzin – our local friend and guide had slowed down his pace to match up with mine. He was telling me the vibrant stories of mountains, about the days and nights, about the changing seasons, about the adventurous and challenging life there and how he still loved the mountains. 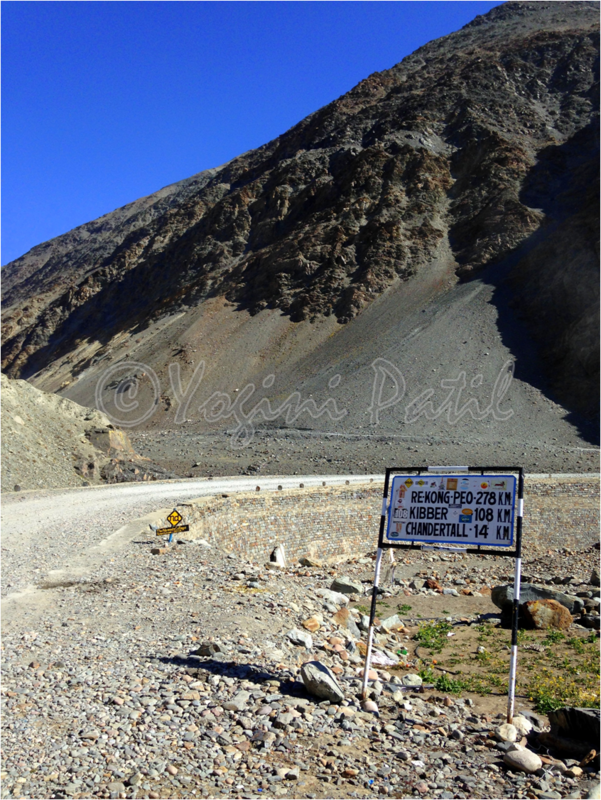 A bus from Kaza en route to Manali had dropped us at Batal. After a much needed break and lunch at the famous Batal dhaba, owned by Dorje chachaji and chachiji, the 14km trek had begun. I was carrying a small backpack loaded with just the absolutely essential stuff for one day, the remaining luggage was kept at the dhaba. In spite of that, the walk was tiresome. To keep away the acute mountain sickness (AMS) and for a quick acclimatization I kept sipping water while chatting with Tenzin. 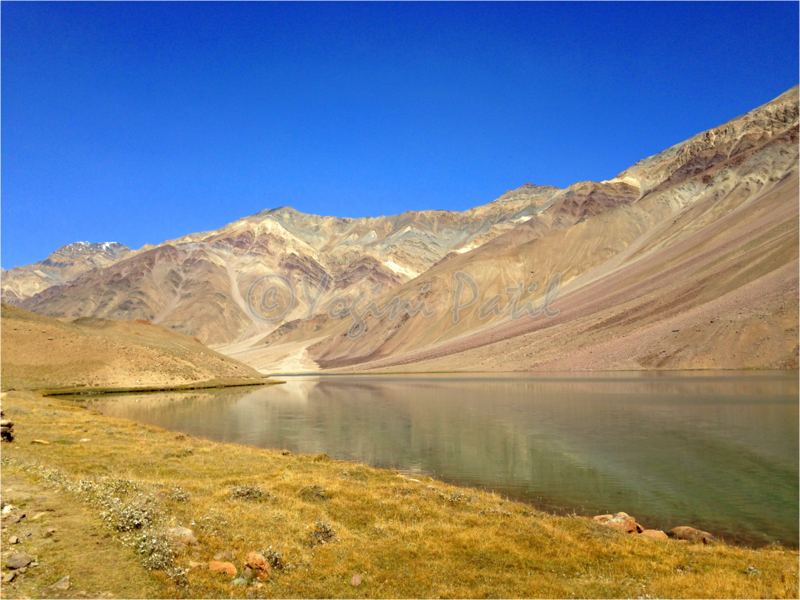 He pointed out the CB ranges (short for Chandrabhaga) with snowy slopes, the glacier research center setup on the other side of the river (a rivulet, when I was there) while continuing with his many ‘mountain’ stories. 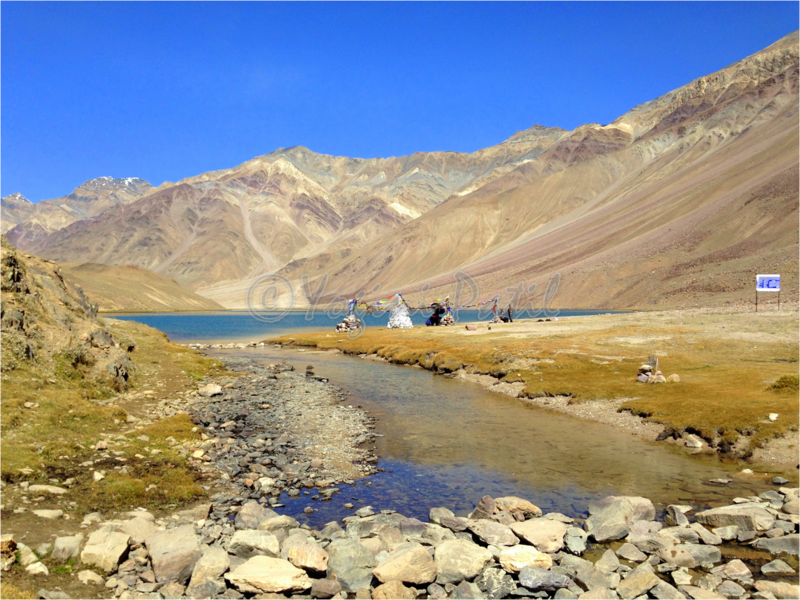 The trek path was surely difficult, but breathtakingly beautiful. Spread across many miles, it was in the middle of nowhere. Bordered with layers and layers of brown and white tipped mountain ranges, it was an experience of being out of the world we know. 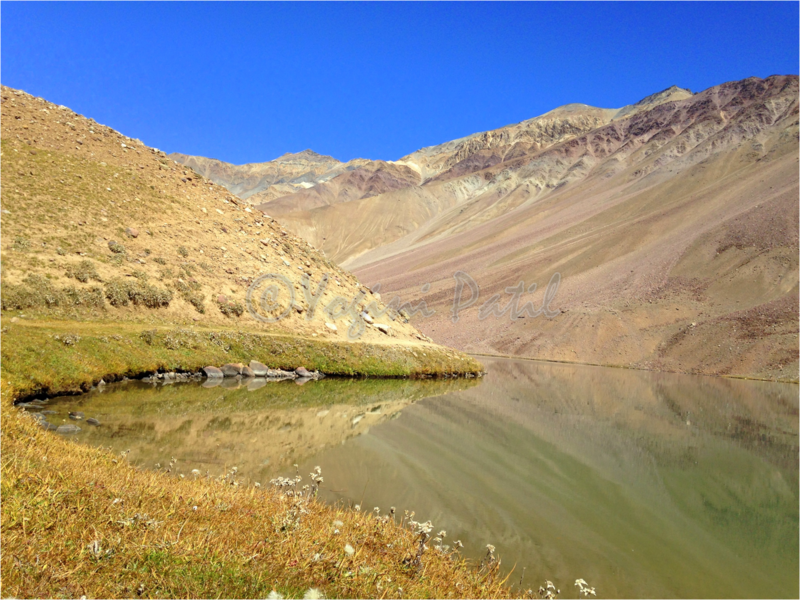 Not a single soul in sight for miles together, with an occasional vehicle whizzing past, I experienced the most tranquil moments of solitude. Sundown and I was still walking. 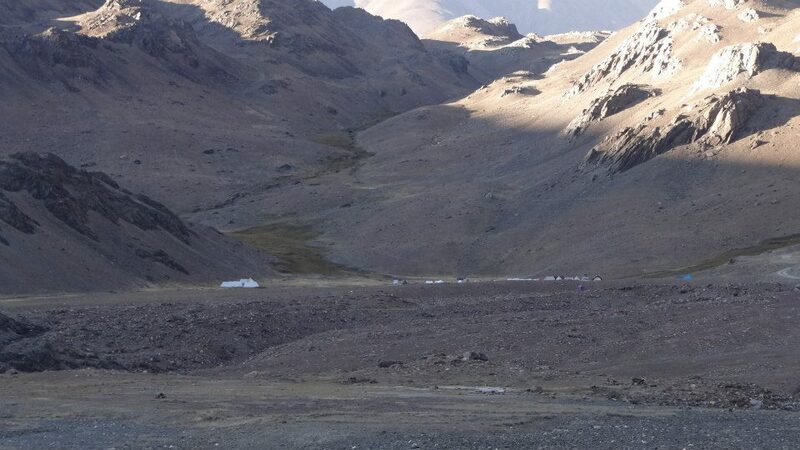 Tenzin had rushed to the campsite to make the arrangements for the stop over. It was getting dark and cold. With each ray fading and disappearing, the winds were turning fierce and hostile – a reminder from mighty mountains that I was in their territory. The campsite looked closer still it took me another half an hour or so to reach. 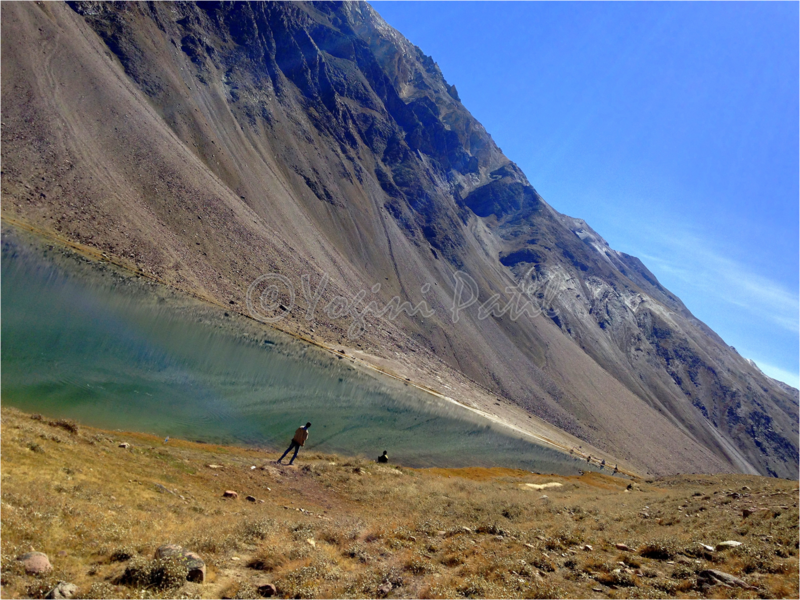 After walking for about 5 hours (yup 5 hours for walking + many breathers for a 12KM trek) we reached the campsite. Nope, not the lake still. 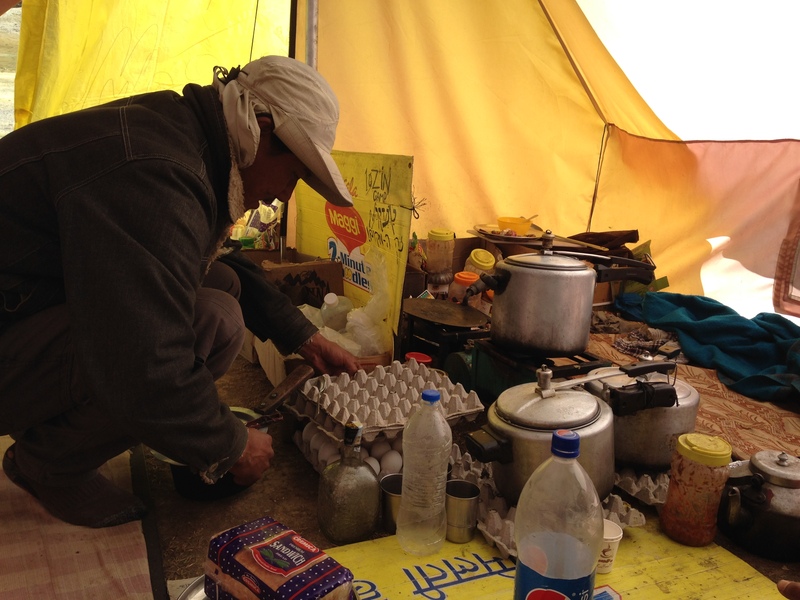 Our host Tenzin prepared piping hot Maggi and black tea and the hunger demon in me devoured it greedily. Thankfully, the tents were set up and were furnished with sleeping bags, blankets, tent light. With the temperature dropping every minute, the cold was seeping into my bones. 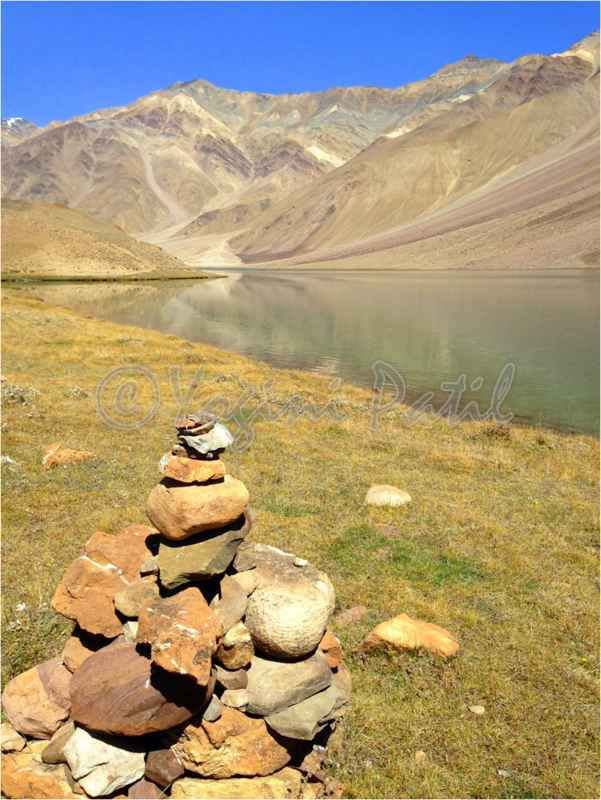 Nature has its own way of doing things, and this is seen here in the mountains. A certain discipline is followed for everything – and like Tenzin said (based on his years of observation) – the icy winds decided to retire at about 9PM. I had a shuteye with many waking and dozing moments throughout the cold night. But surprisingly it was refreshing when I got up at 6AM the next morning. 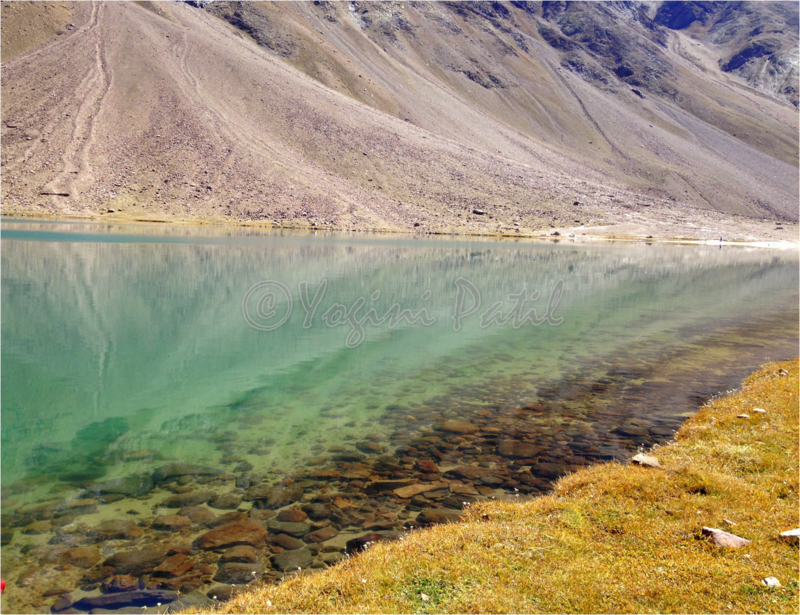 After a hot cup of black tea and only after the sun came out from behind the mountains and filled the valley with the golden warmth, we geared up to trek the remaining 2 kilometers towards the lake. 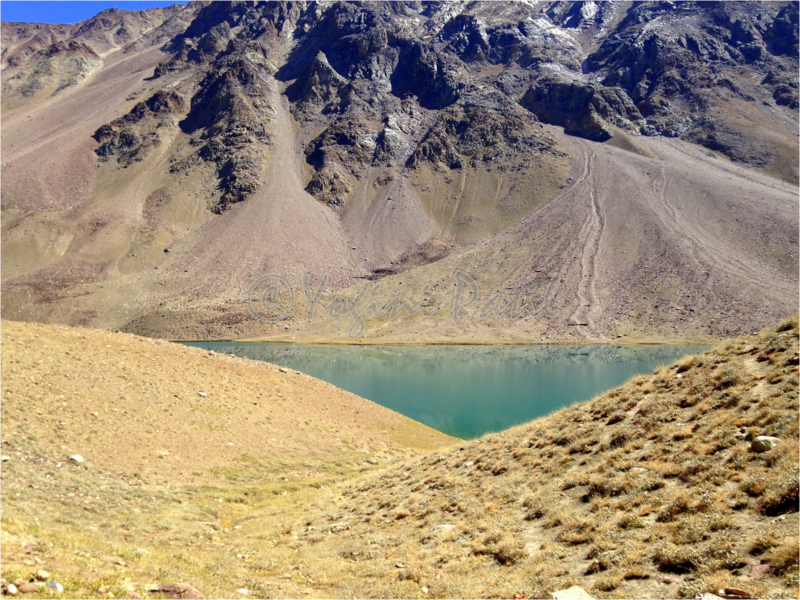 This last couple kilometer looked like forever, but it was one of most beautiful trek paths I’ve walked on. 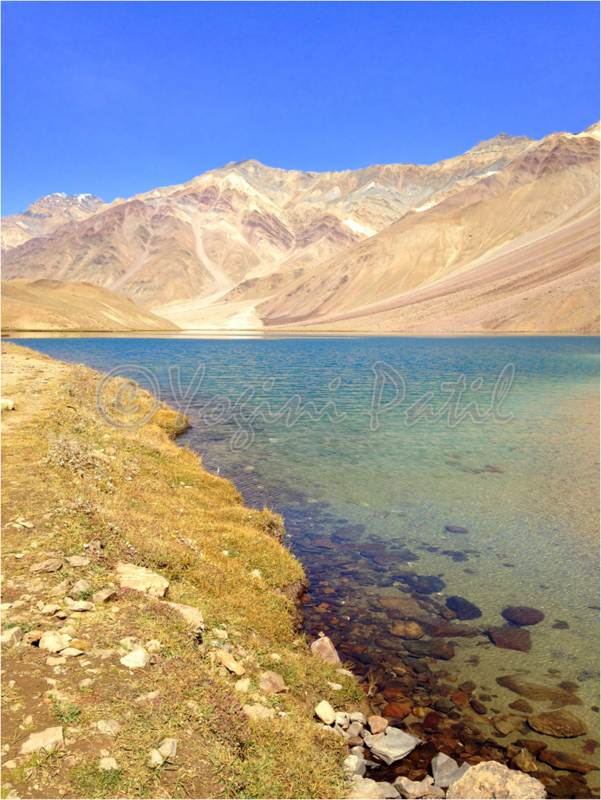 The musing meadows, the peeking brown mountains – some showing off their snowy peaks, the refreshing streams and a blue sky watching from afar created a surreal scene. Finally! 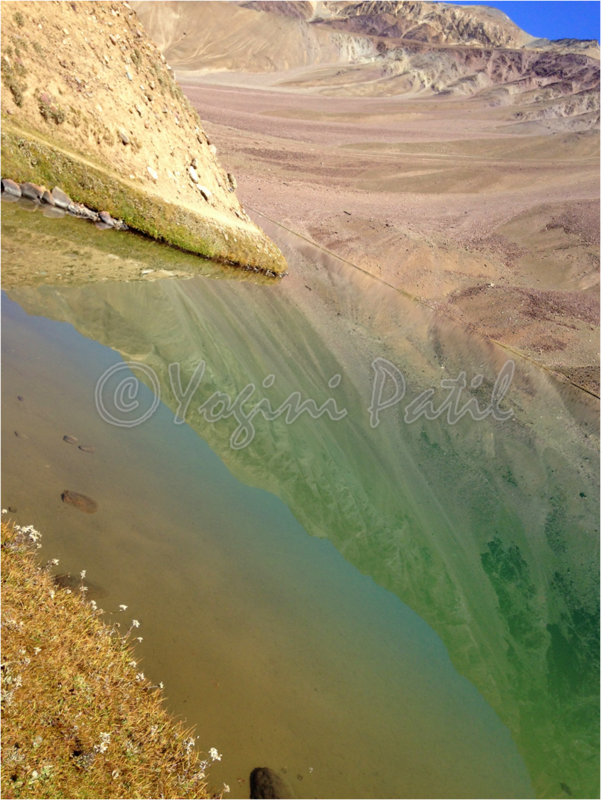 Amidst the dusty brownness, I saw a turquoise triangular patch – first view of the mystic lake and instantly felt euphoric. As I inched closer to the deep blue waters a bout of adrenaline rush filled me up. The closer view was grand and overwhelming. It was a live painting with impressive strokes. 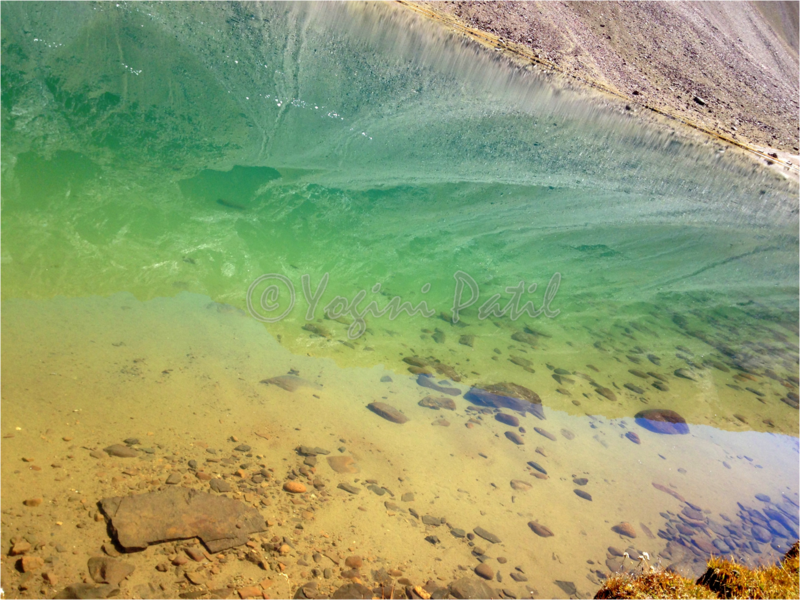 The water was still, crystal clear and blue-green now. 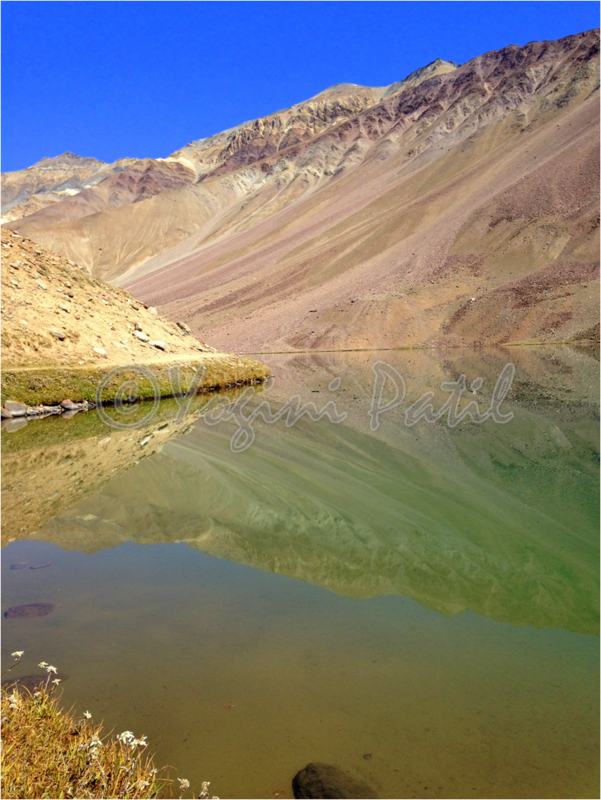 The reflection of the brown slopes and blue sky was splendid. The water changed colors from blue to deep blue to blue-green to ink blue, as I walked along the water on the spiky grass. The lake was beautiful than I had imagined it to be. 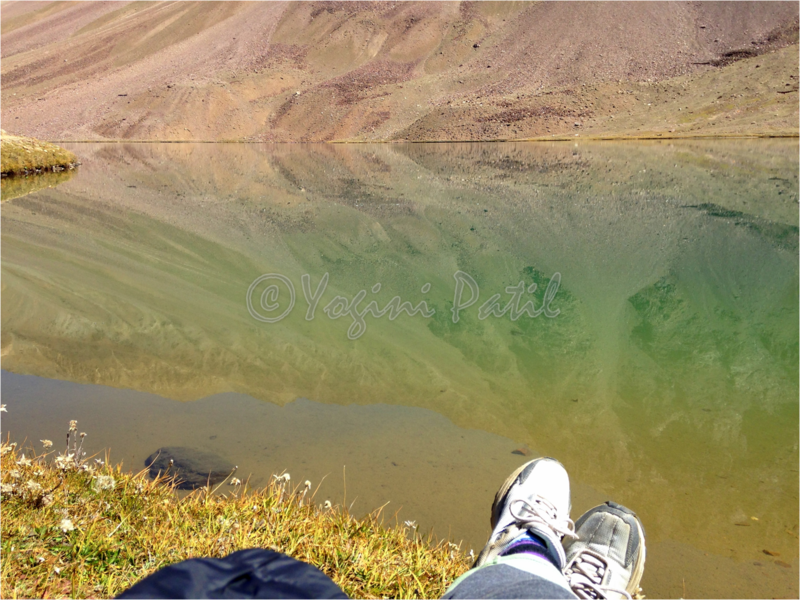 I sat down in contemplation, spellbound by the lake’s alluring beauty. 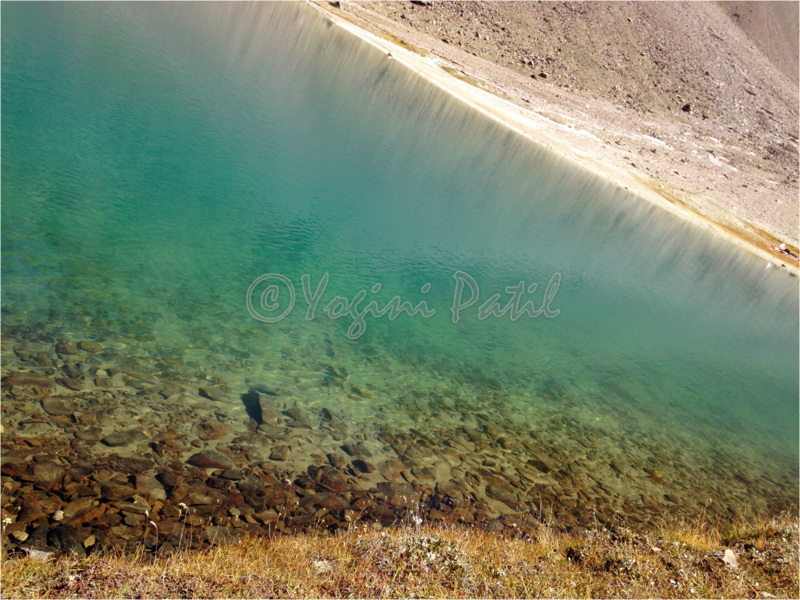 The water was so clear that I could see lake’s floor. I sat there in absolute silence absorbing the stillness of the waters, filling lungs with fresh cold air, getting lost in thoughts and capturing the magnificent view through eyes… little by little deep peace encompassing me. Pingback: Pictures from Travel Diary #7 | Yup...that's me! 🙂 thanks much! 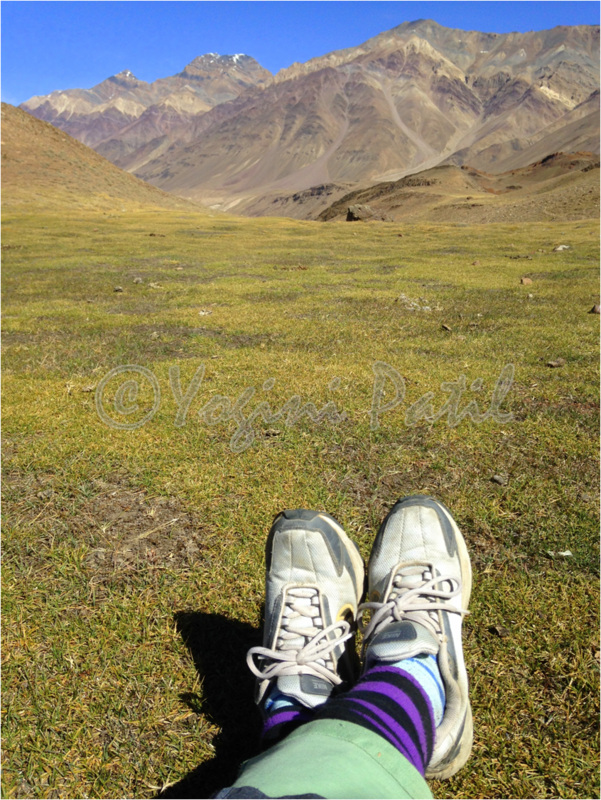 I’m glad you liked them, and yes if you ever visit my country, do visit the Himalayas – they’re enchanting! I’d be happy to help. Is that the place from the movie Seven Years in Tibet?